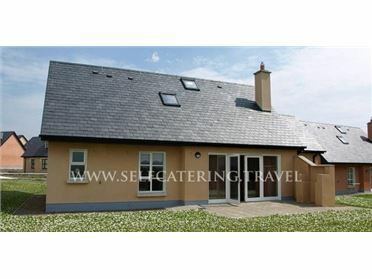 This detached property is located along the stunning West Coast of County Clare. Situated only 0.5 miles from Spanish Point beach where you can enjoy a leisurely stroll it is an ideal location for visitors wishing to experience the rugged beauty of the West of Ireland. Just a 15 minute walk from Miltown Malbay - the home of traditional Irish music and the world renowned Willie Clancy Festival. As a family we have nurtured this property to completion with the utmost love and attention to detail. This home has been decorated to the highest standards with all handmade bespoke furniture throughout. Full property can sleep 10 individuals comfortably. It consists of 4 bedrooms: 1 Kingsize bedroom on the groundfloor; upstairs consists of 1 Kingsize ensuite; 2 bedrooms both containing 1 double bed and 1 single bed. This property has a full open plan kitchen and dining area, a spacious conversatory and a separate living area with a wood burning stove. This property is a must view - the pictures speak for themselves!.